HP made its first acquisition in 1958 when it bought the F Mosley company of Pasadena, California. Mosley made graphics recorders for instruments. This business subsequently became the San Diego Division which made HP's pen plotters. In the 1970s, pen plotters were the only way to get high-resolution hardcopy graphics output from computers. The resolution of output from graphics printers generally varied between 72 dpi and 100 dpi. But, even HP's earliest digital pen plotters could produce a line resolution equivalent to 1000 dots per inch. Until 1987, pen plotters were also the only cost-effective method of getting color output from computers. 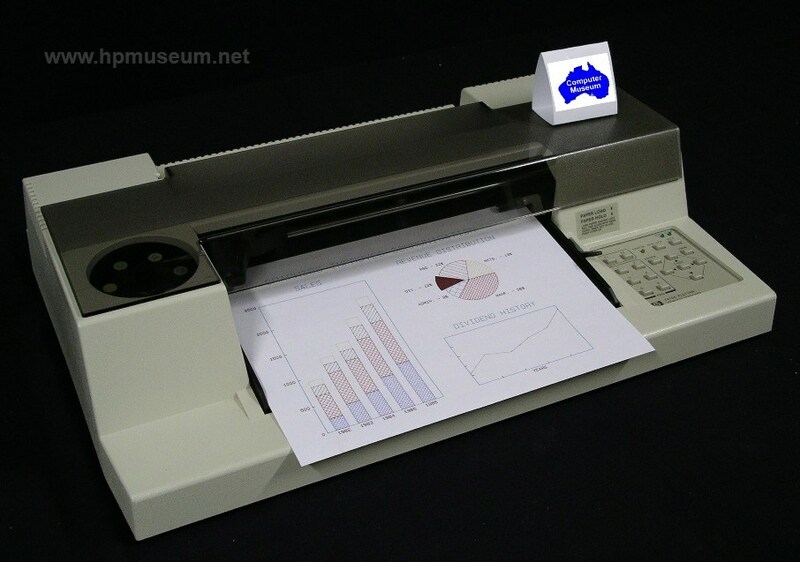 Compared to modern color inkjet and laser printers, pen plotters were very slow and cumbersome to use. Users had to constantly worry about a pen running out of ink. If one pen ran dry at the end of a plot (of say, 45 minutes), the entire plot had to be re-done. HP plotters were also limited to a maximum of eight different colors, without having to change pens in the middle of a plot. Finally, plotters could only draw lines and vectors; they couldn't reproduce raster or photographic images. Despite these limitations, the high resolution and color capability of pen plotters made them the color hardcopy output device of choice until the late 1980s. During this time, HP enjoyed a worldwide market share of over 50%. Plotters were a good, though not spectular, business for HP through the end of the 1970s. Then, the business expanded rapidly due to three factors. First, HP introduced paper-moving plotters to replace the old flatbed technology. This made the machines smaller and less expensive. Second, HP entered the large-format plotter business which had previously been the domain of companies like Calcomp and Versatec. Third, connection of HP pen plotters to non-HP systems grew dramatically (as had happened previously with HP's terminal business). The connection to non-HP systems was driven by use of business graphics on IBM and compatible PCs. These products were developed at HP's San Diego Division. Pen plotters were product line 30 for the division until the product lines were split in 1989. The large format plotters retained the PL30 designation while the small plotters and PaintJets became product line 5M (Color Graphics Imaging). Be sure to visit our Supplies and Consumables Catalogs for part numbers and information on all the pens, media, cables and accessories available for these products. Computer museum's are generally only interesting to people who are interested in old computers. Much of what is interesting about old computers is inside machines and not visible. Spinning tapes and blinking lights don't tend to capture the attention of the general public. Pen plotters are different. These machines are fascinating to almost everyone. This fascination is probably enhanced by the fact that most computer users have never seen a pen plotter in operation as they largely died out in the early 1990s. Pen plotters are marvels of mechanics. The speed at which the later, paper-moving models worked is impressive to all museum visitors. The most impressive pen plotter ever (the 7550) is now over twentyfive years old. This exhibit hall includes videos of pen plotters in operation including: 9862A, 7580A, 7440A, and the 7596A. It is becoming increasingly difficult to find pens for pen plotters, especially for the models that preceded the 9872. There is still a company that makes pens for all HP pen plotters, even the earliest models (Vermes).